The Elan Ripstick 86 is a great ski for the strong intermediate to expert skier who will be spending the majority of their time on the frontside of the mountain who wants some off trail versatility. 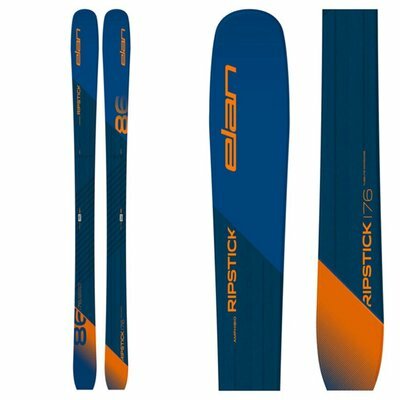 Elan's TubeLite Woodcore uses 5mm thick carbon tubes that from the tip to the tail behind the sidewalls that follow the sidecut of the ski that add extra energy, stability and responsiveness while reducing the total weight of the ski. VaporTip Inserts defect negative vibrations, improve floatation and enhance the maneuverability. SST Sidewalls are slightly slanted to also help shed some weight and deliver some extra edge grip. The Mountain Rocker delivers a quick and smooth entry and exit with easy steering in any type of condition. If you want to carve, but not limit yourself to the groomers, the Ripstick 86 from Elan is a perfect option.